Home ・ Library ・ Research Essays ・ RE No. 9:The ECB’s Monetary Policy: Stability Without “Safe” Assets? RE No. 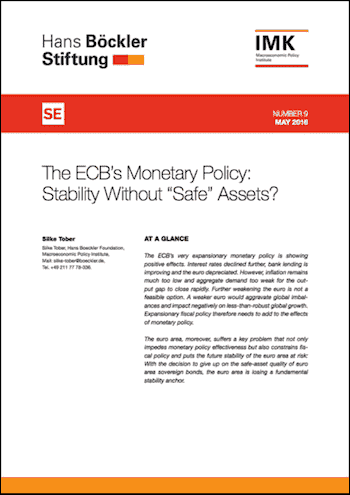 9:The ECB’s Monetary Policy: Stability Without “Safe” Assets? The ECB’s very expansionary monetary policy is showing positive effects. Interest rates declined further, bank lending is improving and the euro depreciated. However, inflation remains much too low and aggregate demand too weak for the output gap to close rapidly. Further weakening the euro is not a feasible option. A weaker euro would aggravate global imbalances and impact negatively on less-than-robust global growth. Expansionary fiscal policy therefore needs to add to the effects of monetary policy. The euro area, moreover, suffers a key problem that not only impedes monetary policy effectiveness but also constrains fiscal policy and puts the future stability of the euro area at risk: With the decision to give up on the safe-asset quality of euro area sovereign bonds, the euro area is losing a fundamental stability anchor.